Iran suggests council workers were spying; "acting contrary to international law"
LONDON, England (CNN) -- British Foreign Secretary David Miliband on Thursday urged Tehran to allow the British Council to resume operations in Iran, shortly after London announced it was suspending the cultural organization's operations because of Iranian pressure on its staff. 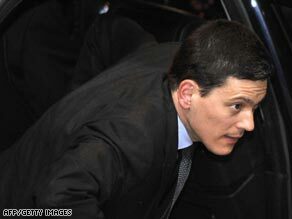 David Miliband called the suspension of the British Council's work in Iran "a matter of great regret." "The people of Iran do not want to be isolated from the world. So I hope the Iranian government will enable the British Council to resume normal operations as soon as possible," Miliband said in a written statement. He criticized "unacceptable pressure put on (British Council) staff by the Iranian government." The council is Britain's organization for international "cultural relations and educational opportunities," according to its Web site. Iran dismissed British press reports about the controversy as "baseless and misleading." Iran's embassy in London said British Council staff had acted improperly, seeming to suggest they had been spying. "The activities of individuals under the name of British Council, while working in places where the British diplomatic offices are located, are contrary to international laws and conventions," the embassy said in a statement published by IRNA, Iran's state news agency. Many of the local staff was told to quit working for the British Council, and two had their passports taken away, the British Council said in a statement released Thursday. "In the last week of December, most of the 16 locally appointed members of staff were summoned for interviews at the Iranian Office of the President where it was suggested to them that they should resign from their posts," it said. "This follows on from an incident where two members of staff had their passports confiscated after attempting to leave the country to go to a routine meeting." The suspension took effect January 31 but was announced only on Thursday, five days later. The head of the British Council pointed out that Iran maintains similar agencies in Britain. "I welcome the fact that the Iranians have cultural centers here and want the British people to better understand their country through this kind of work. But this can not be a one-way street," Martin Davidson, chief executive of the British Council, said in a statement. The British Museum is due to open a major exhibition on 17th century Iran in two weeks. The exhibition is being sponsored by the Iran Heritage Foundation, a British non-profit organization. Miliband emphasized that the agency's work is "completely non-political," and called it "a matter of great regret that a country with Iran's culture should reject attempts to break down barriers and build cultural dialogue." The British Council first established an office in Iran in 1942, which was suspended in the wake of the Iranian revolution in 1979. After a 22-year absence, it reopened in Tehran in 2001 specifically at the request of the Iranian authorities, the organization said. "Over the eight years that followed we achieved much with our Iranian partners and staged the first Western theater production -- Shakespeare's "Winter's Tale" -- and the first exhibition of Western sculpture in 25 years," it said.